The elevating mechanism for marble machine 2 is a series of gears with holes in them for the marbles. 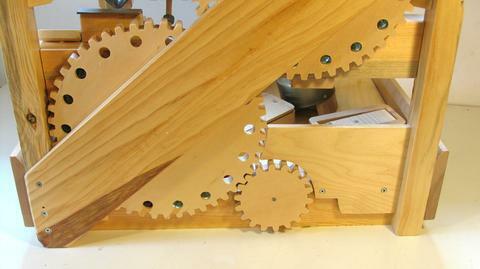 The small gear is coupled to the crank at the front of the machine with a metal shaft. This gear drives the first elevating gear, which then drives the second elevating gear. The holes in the gear wheels are slightly angled so that at the bottom of the gear, they slope downward into the gears. This directs marbles to roll into the gears. As the wheel turns, when the holes are at a half-way point the slope becomes sideways, and at the top it becomes a downward slope. So once past the half-way point up the wheel, the marbles tend to roll out of the gear. So I added a guard to prevent the marbles from rolling out before they get to the top. The floor of the machine consists of two sections of plywood, each sloped towards the pick-up point at the bottom gear. Near the gear, there is an arched and beveled contour in the floor that pushes the marbles in towards the holes in the gear. There is a similar contour at the bottom of the second gear. Marbles leave the first gear, roll along the track, and into the second gear. The holes flare out a little on the leading edge. 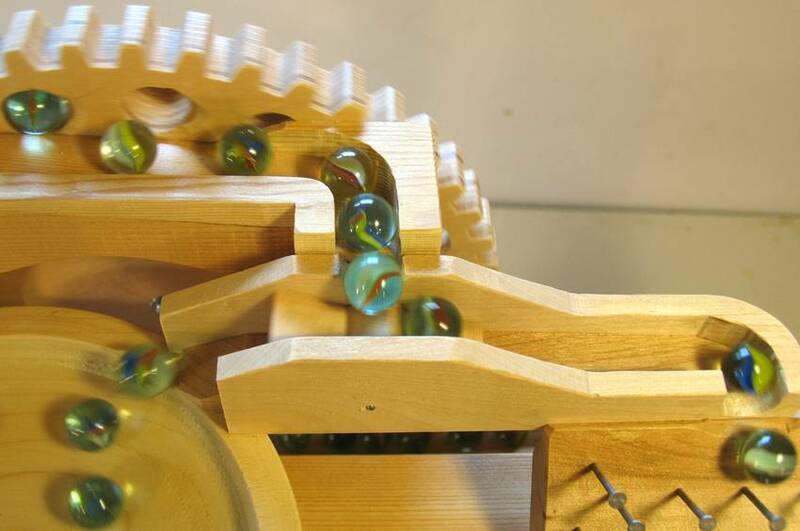 This allows the marbles to roll into the holes more smoothly, especially when the gears are turned relatively fast. Once the marbles get to the top, they hit this "flipflop" which sends them alternately left and right. The flipflop can just barely keep up with the flow of marbles - as many as six per second. 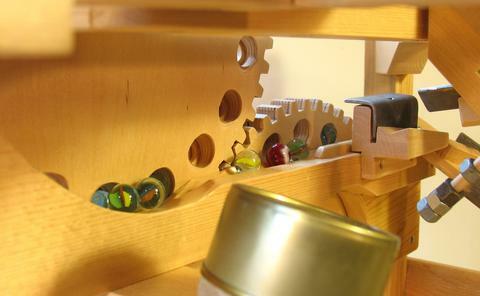 The marbles that are deflected to the right hit this "pinboard", where they bounce randomly between the nails. 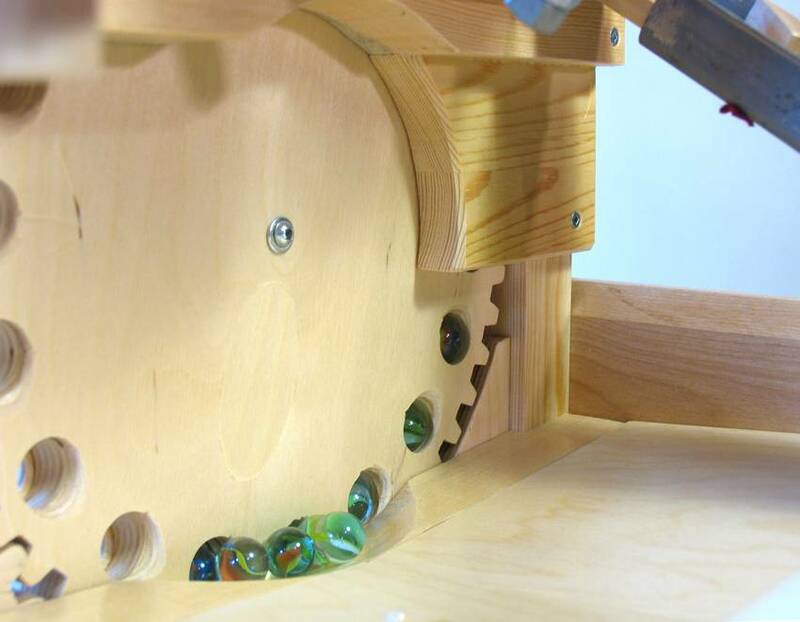 Half the marbles end up hitting the "dumpomatic" on the left, the rest fall onto a track made from a piece of angle iron. I had to add a bit of coat hanger wire to direct the marbles onto the angle iron. Without it, many ended up rolling off the end. Here you can see the dumpomatic in its dumping phase. 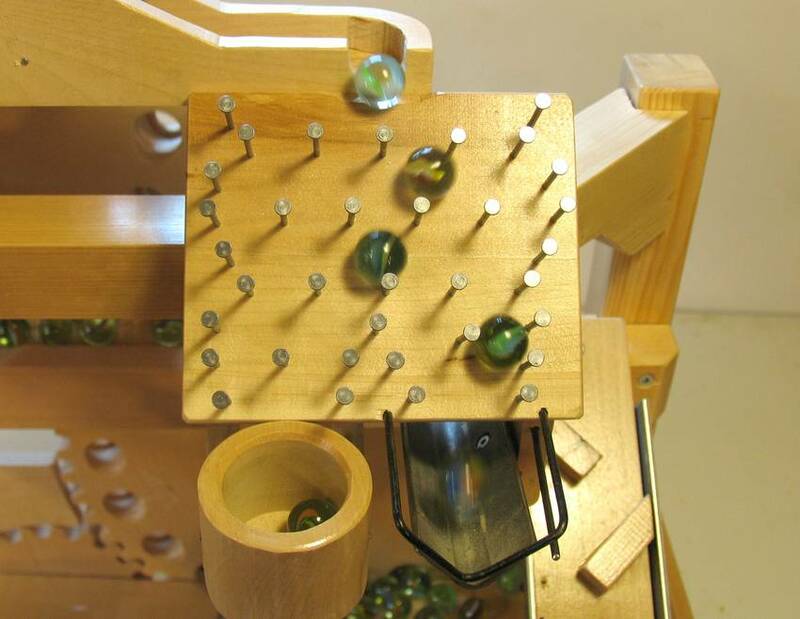 When it gets enough marbles in it, it tips forward and dumps the marbles on the xylophone boards below. Once empty, the counterweight brings it back up. The marbles that hit the angle iron roll back, where they hit another small, loosely mounted angle iron and ramp. This deflects them onto a zigzag that has angle iron on either side. These angle irons are also loosely mounted so that they ring as the marbles hit them several times on the way down. 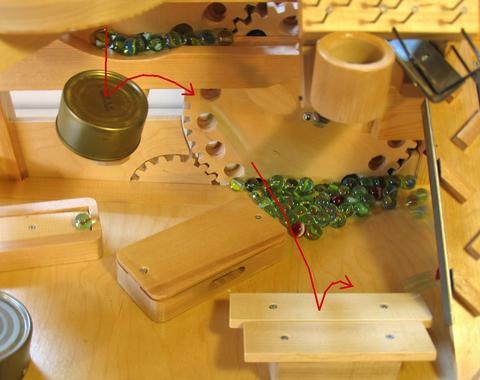 At the bottom, the marbles shoot past the xylophone boards and eventually roll back to the gears. The marbles that go left from the flipflop at the top swirl around this bowl until they randomly fall down one of the holes in the middle. The marbles swirl around for quite a while, and at the rate at which they get fed into this bowl, it can get quite full of marbles! One of the ramps at the bottom of the machine leads to a drum made from a tuna can. 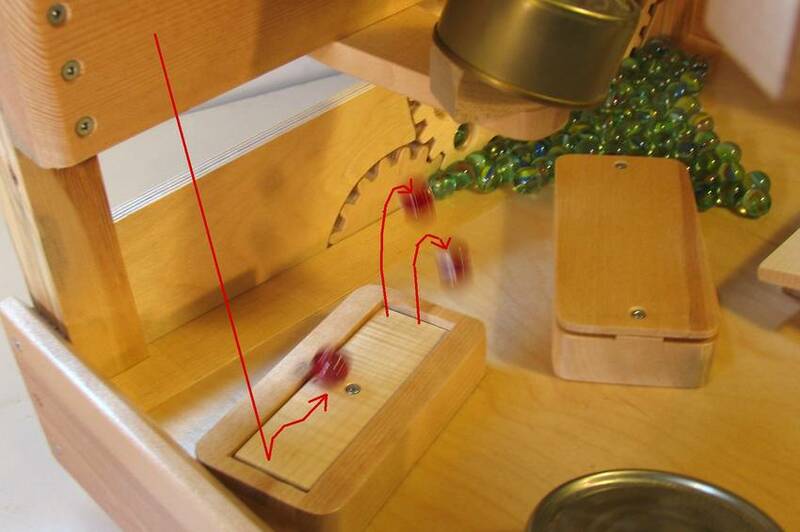 This drum bounces the marbles towards a clacking box. 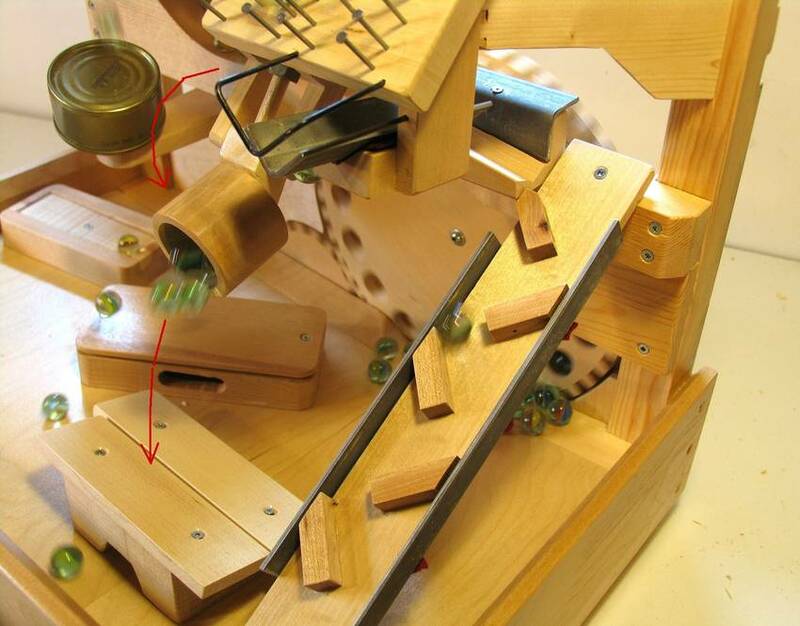 Another ramp drops marbles onto this little "rocker". The marble drops on the left side, then rolls to the right. The next marble to fall onto the left will bounce the previous marble off the rocker, and then itself roll right. This mechanism doesn't always work perfectly. Sometimes there are two or three marbles on the end of the rocker, but usually the next marble will eject more than one of them to start clearing the jam. 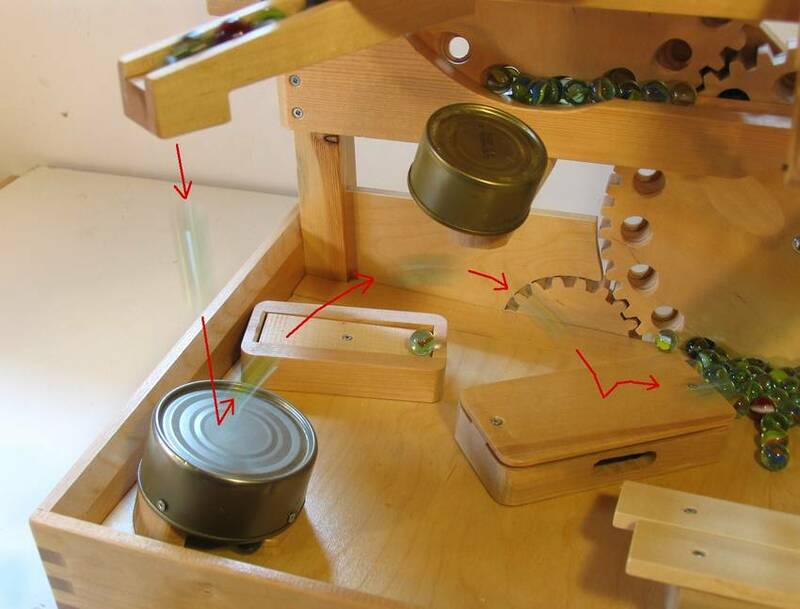 A tuna can mounted below one of the holes on the bowl bounces marbles towards the xylophone boards. 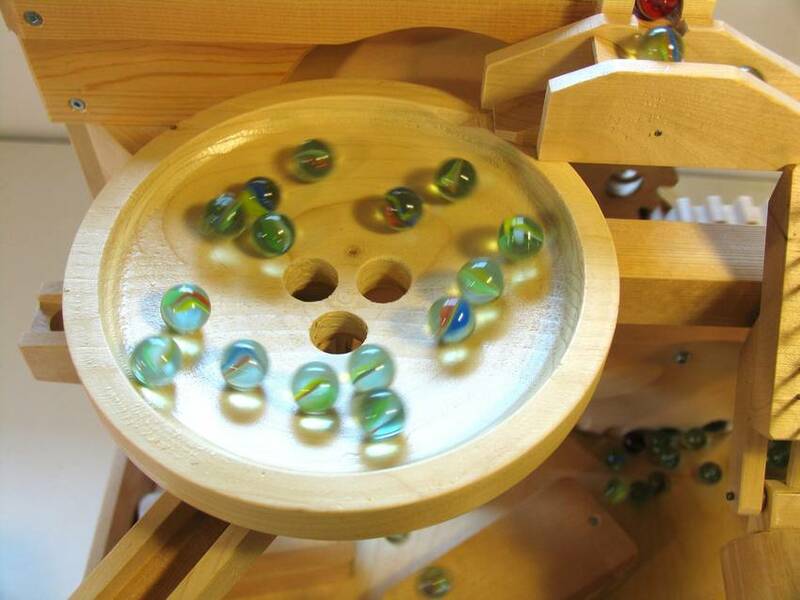 The marble machine keeps an awful lot of marbles in transit at any one time. 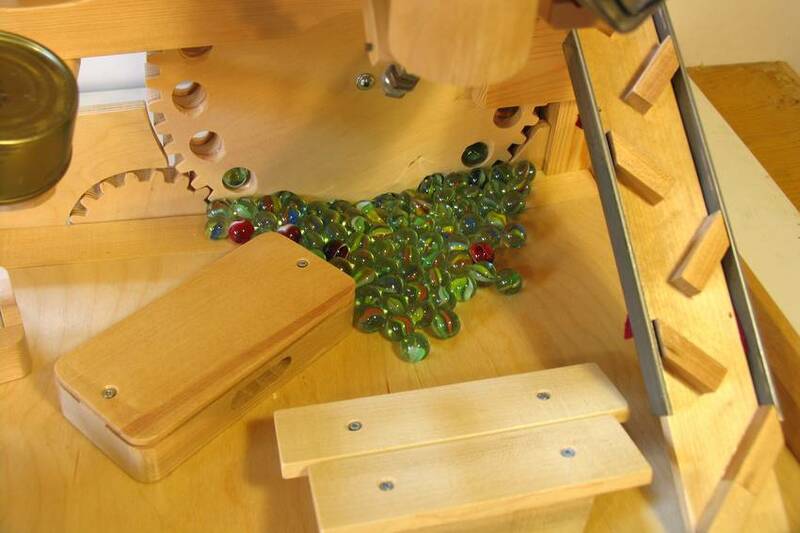 It takes about 85 marbles to keep the machine fully fed when cranked at full speed. Any less marbles, and marbles don't return soon enough to keep the gears fully fed. At full speed, the machine runs through about six marbles per second.